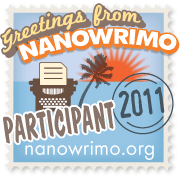 If you’re following even one writer on any of the social networking sites you most likely know what NaNoWriMo is by now. If not, here’s the short version. November is National Novel Writing Month. So, to celebrate, people of all shapes and sizes attempt to complete a 50,000 word novel within the thirty days of November. Last year I decided against doing it because I hadn’t “won” NaNo the five previous years I’d made the attempt. However, this year I have a definite story idea in mind and I’m giving it a go. It’s actually just the incentive I need to get some words done. Lately I’ve concentrated on promo and playing online more than actually writing anything. Time to get back in the zone. So, if you’re a NaNoer too, feel free to add me as a buddy. I’m listed as mjhmcginnis. Next Next post: Readers n’Ritas!